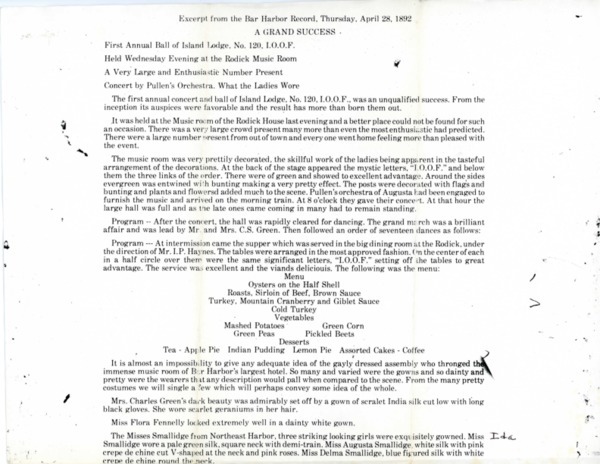 Description:Description of the First Annual Ball of Island Lodge, No. 120, I.O.O.F. held at the Rodick Music Room in Bar Harbor. Ida, Augusta, and Delma Smallidge of Northeast Harbor attended. Description:A review of twenty Maine artists inspired by the Maine landscape before WW II. Description:The Photograph of the Memorial is in Photograph Collection #1304. This is the History of the Downeast Chapter, lists of men lost in action in WWII, dedication at Maine Maritime Academy. Description:Holiday card with church, Santa and reindeer. 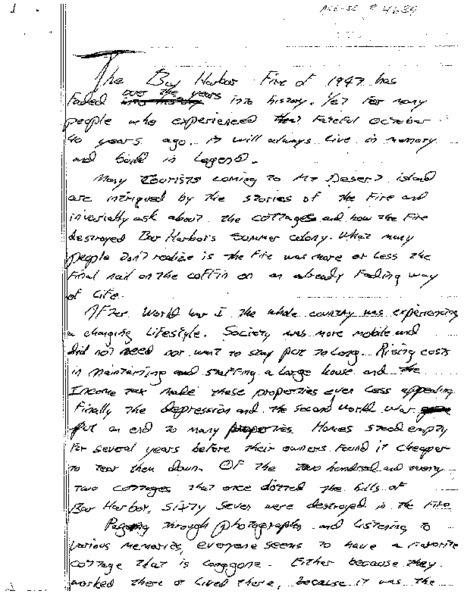 Description:Written on the page in pen "Echoed form the So. Dakota 'Black Hills' to Maine's Mt. Desert - 1937." 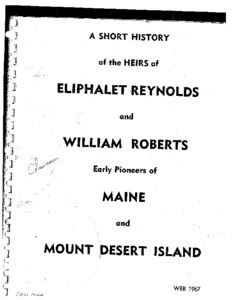 Description:Genealogy of the Reynolds & Roberts families beginning in 1853 with Eliphalet Reynolds. Author traces lineage and includes many family stories of early years in Northeast Harbor. 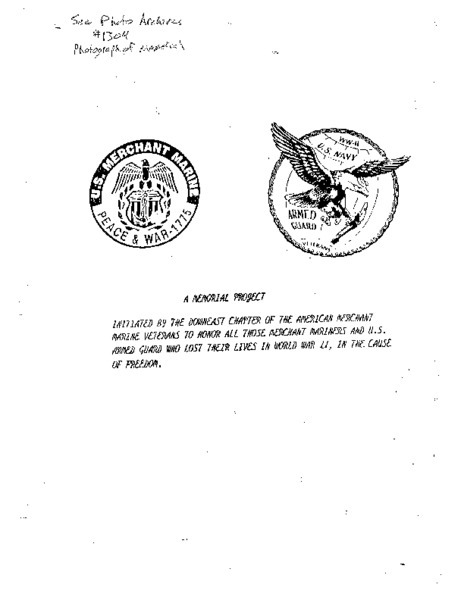 Description:January 20, 1981 A study of the folklore of Mt. 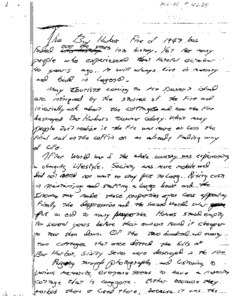 Desert Island and surrounding islands by Ms. McFarland done as a high school term paper. 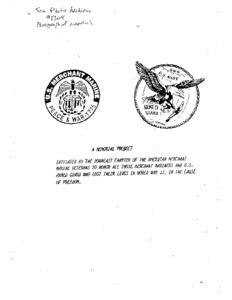 Description:Special section reprinted in Ellsworth American in 1977 of chapter 12 of "Grants & Sales of Lands" with original land titles and detailed maps. A Town Warrant for 9/13/1824 for Town of Mount Desert. Description:A warrant for MD Town Meeting & results of the Town Meeting & a warrant written on 2/8/1825 with list of agenda for Town Meeting 3/1/1825. Description:Memorial service on July 4 ? for Ruth Jordan; includes the eulogy of John Adams. 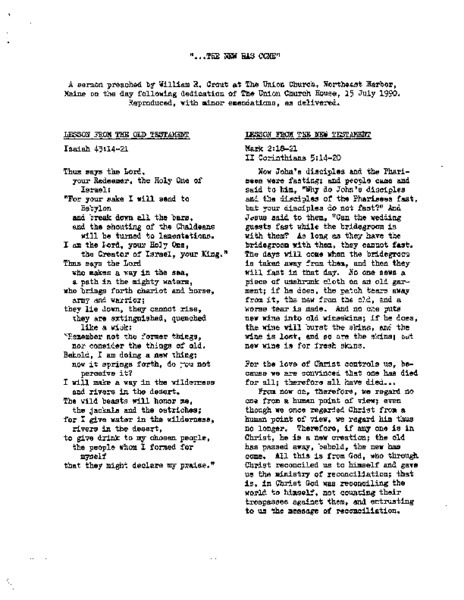 A song written by Trish Scull and a poem about Ruth are included. 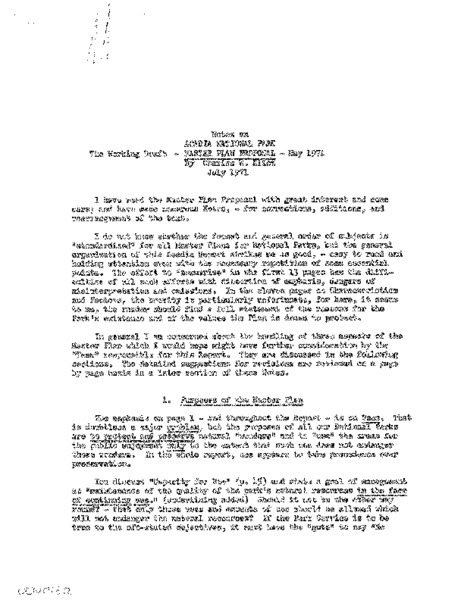 Description:Senior college essay of Eleanor Kinney about the development of Acadia National Park and conflicts between the summer residents and year-round working residents. 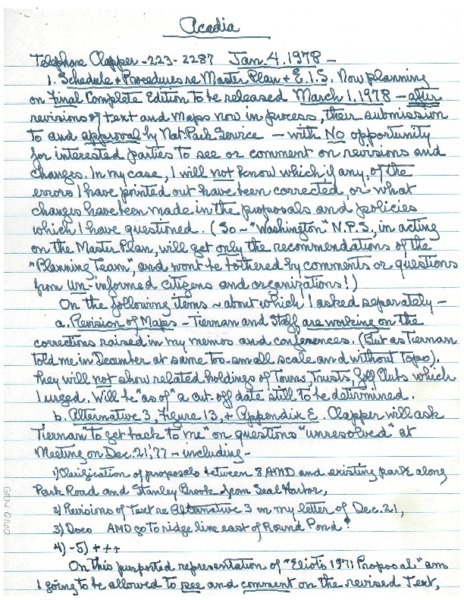 Description:Draft of commencement address of Robert Pyle, Librarian, to 8th grade of the Mt. Desert Elementary School on June 16, 2004. 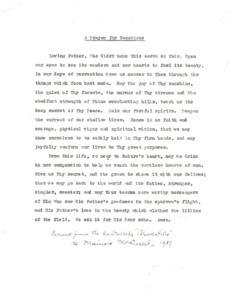 Description:Copy of Dr. Mitchell's address before the Bar Harbor Village Improvement Society, August 8, 1905. Original brought to Library by Mimi Miller. 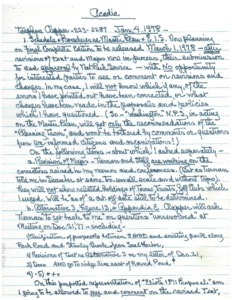 Description:Hostages held in Iran from Nov. 1978-Jan. 1980 denied compensation from Iranian assets. Moorhead Kennedy of Mount Desert was among the hostages. 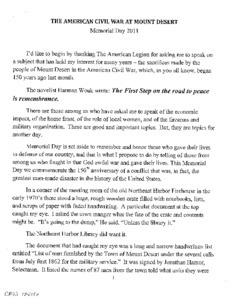 Description:Copy of Memorial Day address of Robert R. Pyle, Library Director, at the annual ceremony at the Joseph Musetti Park. 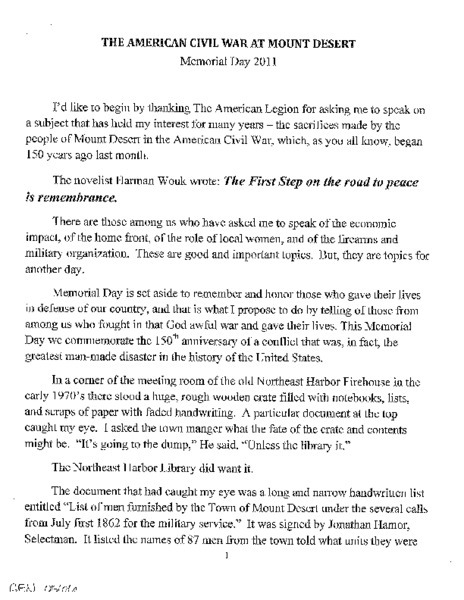 The address was a remembrance on the 150th anniversary of the Civil War. 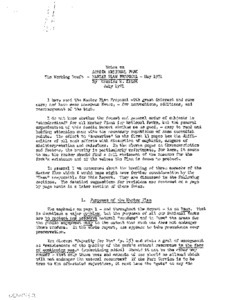 Description:Draft of an act to amend the use of automobiles in Mount Desert. Description:Thesis contains exploration of the Colonial Revival through selected works of Fred Savage, architect. A thesis Submitted to The Savannah College of Arts & Des. Description:MDI Hospital, Bar Harbor, ME is accredited by the Joint Commission on Accreditation of Hospitals & Licensed Under Maine State Department of Health & Welfare. Description:In commemoration of the laying of Atlantic Cable by Cyrus Field. Description:Diploma signed by Eunice H. Dunbar, Principal and Winifred E. Clark, Superintendent. Description:Collection of biographical material of Asa A. Knowles, 3rd. president of Northeast University in Boston. He was born in Northeast Harbor on January 8, l909. 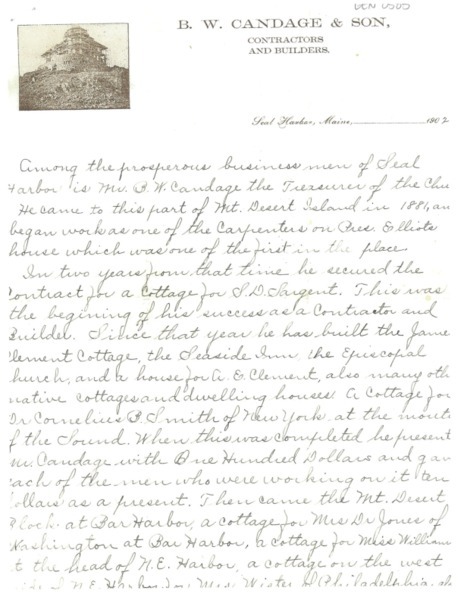 Description:Application to U.S. Army Signal Corps signed by Augustus Phillips of Northeast Harbor in 1917 along with three letters of recommendation by Dr. Grindle, Rev. Lee, and Harry Tipton and a Photograph of A. Phillips. 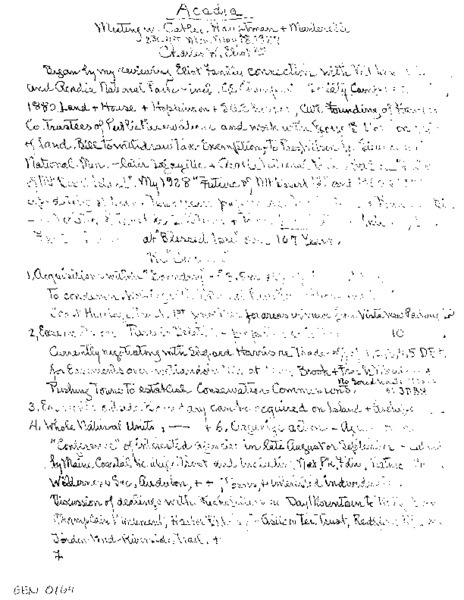 Description:List of Maine authors in the Maine author collection at the Maine State Library 1978. 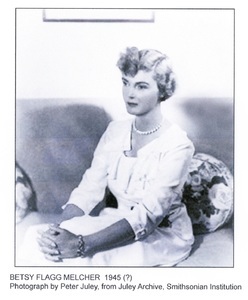 Description:Autographs and poems of friends of Cora L. Gilpatrick. 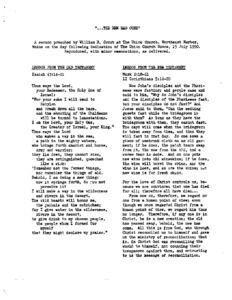 Description:Copy of a poem by Herbert Weir Smyth, Harvard professor, about the vote of residents of Mount Desert banning automobiles in the town. 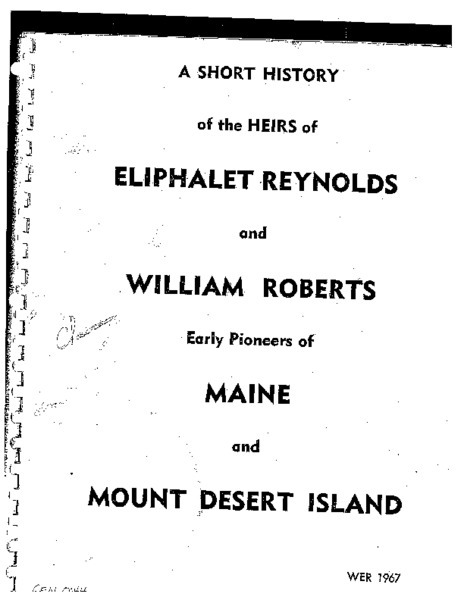 This was published August 23, 1913 in Bar Harbor Life. 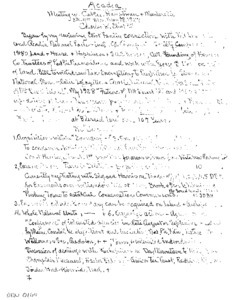 Description:Handwritten report listing residences & buildings attributed to B. W. Candage & Sons, contractor/builders/masons beginning 1881. Samuel & Arthur became partners as carpenters/masons in 1890. 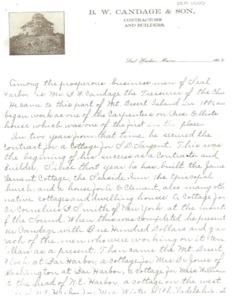 Description:Copy of a hand-printed report (of a BH summer resident?) of summer cottages selected for their Architectural qualities which were destroyed in the Fire of 1947. Greenway Court, Archbold, Thirlstane, Mizzentop and Stanwood. Beatrix Farrand's Plans on Exhibit at Hist. Soc. Description:Beatrix Farrand to present landscape plans at Village Improvement Society meeting in Bar Harbor. 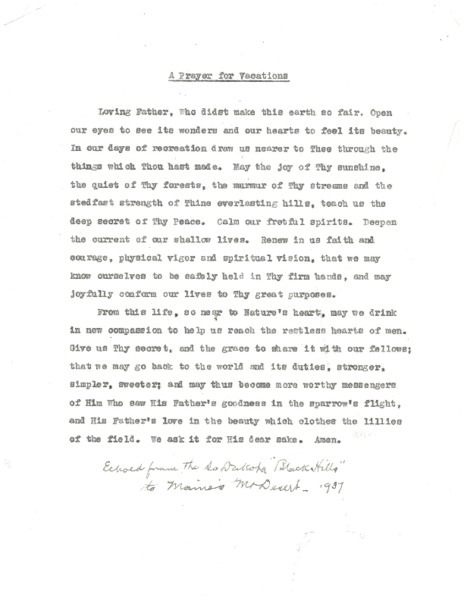 Description:Brief biography of Beatrix Farrand upon her death in 1959. She was the last of the charter members of the American Society of Landscape Architects. Description:Description with Photographs and diagrams of Beatrix Farrand's designs of the gardens at Dunbarton Oaks. 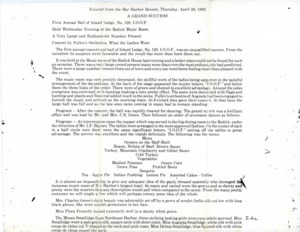 Description:Address to Northeast Harbor Library corporation and board members at the dedication of the new building on Joy Road in August 1950. Mr. Pepper, one of the first trustees and was actively involved in fund raising activities.